Jan Spence opened her door to find a small owl sitting at her doorstep in Ponte Vedra Beach, Florida. “It was amazing,” Spence told the New York Daily News. Imagine the surprise this woman must have felt as she opened up her front door and saw this! A beautiful owl sits on her porch, looking right into the camera. We're not sure if he's looking through the glass, or looking at his reflection, but either way it's really rare to be so close to the majestic owl! Just like the woman, in the video, I have never been this close to an owl before. It's really interesting to see how they interact up close and personal! Animal control told Spence to leave the owl alone and it would leave. But, the next day, the bird was still walking around the neighborhood, so she took it to Bird Emergency Aid & Kare Sanctuary (BEAKS). Responses to "Whooooo’s There? 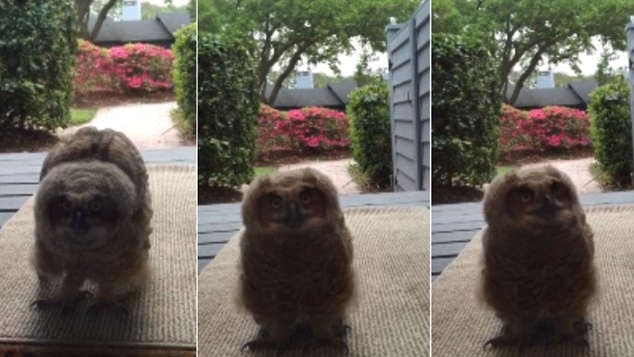 Baby Owl Shows Up At Woman’s Doorstep"